As the weather starts to feel a bit colder (well at least in the mornings!) we begin to think about warmer clothing. Cashmere is one of the most luxurious fabrics to wear. But what about cashmere and its eco credentials? Once the prerogative of those with deep pockets, cashmere is available in budget conscious brands. Should we take advantage of these cheaper options? Personally I think we should think twice before buying cheaper cashmere. We need to first understand what it means to cashmere and its eco credentials. Cashmere has an incredibly soft feeling. It comes from the neck and underbelly of the Kashmir Goats. Kashmir Goats are indigenous to remote regions of Mongolia. They are exposed to an extremely harsh climate and develop an undercoat of fine hair that they shed in the spring. The hair is combed from the goats. We’ll get on to shearing later. It takes the hair collected from 4 goats to make one sweater. There is then a lengthy and complex process to manufacture. You may already be starting to question cashmere and its eco credentials. So What About Cheap Cashmere? Demand started to grow dramatically from 1990s. This is when cashmere and its eco credentials started to fall apart. Farmers increased the size of herds. More animals needed more grazing. Over grazing led to destruction of the landscape. Goats eat the roots as well as the grass and vegetation. 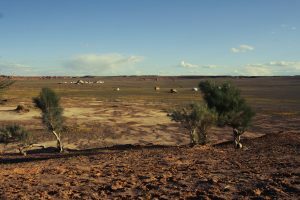 The hard ground of the mountainous deserts meant they were destroying their own food resources. The demand for more cashmere led to dubious practices of shearing goats, rather than combing them. If this wasn’t bad enough goats were being shorn in the wrong weather and consequently many died. Brands like Asos are now putting a stake in the ground and refusing to stock cashmere from 2019. Is The Eco Price Is Too High? So should we simply say that cashmere and its eco credentials mean we should stop buying cashmere? We could, but that approach means we destroy the livelihoods of those depend on goat herding and collecting the fibers. The landscape and climate where the goat herders live is remote and not suitable for other ways to earn a living. 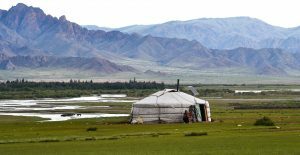 Companies like Naadam are focused on a truly sustainable approach. The founders also helped to found an NGO in Mongolia called the Gobi Revival Fund. This NGO helps the people of the region to sustain and promote their unique identity. 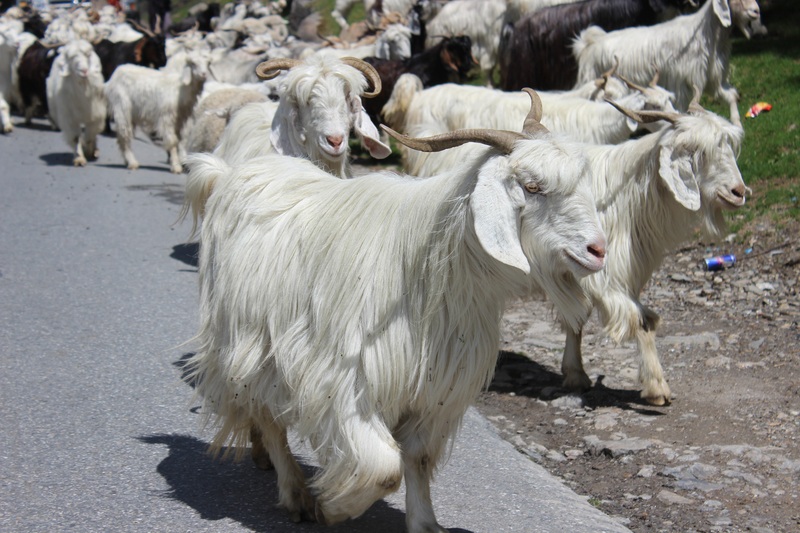 British Brands like N.Peal take a responsible approach and can trace their cashmere back to the individual herders. Bigger brands like John Lewis ask their suppliers to sign a code of practice. But do admit that this relies on suppliers being responsible and self-regulating. How Do Tell If Your Cashmere And Its Eco Credentials Are High? Price is a guide. It’s not going to be the only way to tell if your cashmere is responsibly sourced. The percentage of cashmere in a garment is another indicator. More cashmere and less other fibres is a positive indicator. Tighter knits. A tighter knit is indicative of 2-ply yarn and a better quality. Look at the brand. Do they state how they source and verify their suppliers? Many brands claim to be transparent and source ethically. In our fast paced hectic lifestyles we may be too ready to take this at face value. But maybe dig a little deeper? Buy from responsible brands and consider that buying something made in cashmere is a real investment piece. Buy something you will love and treasure for years to come. Ensure that you care for it in the best way possible. Even pure cashmere may suffer from pilling if it’s subject to friction (seat belt, rough clothing etc). But with pure cashmere pilling only occurs once. Avoid washing in a washing machine. I have my husband’s socks that now just about fit me to prove this doesn’t work! Instead hand wash in baby shampoo. If you want to shop more ethically, why not download a copy of my free guide to Environmentally Friendly Brands?